Imagine this, you walk into a supermarket and go ahead with your weekly or monthly purchase routine. Let’s take an example of a guy’s case. Let’s name him John and let’s make some assumptions (some bordering on generalizations, but just to make a point). Now let’s profile him. John is a 35 year old male working as an Insurance Broker with an MNC. He is married and has 2 kids. A complete family man, he takes pride in the fact that he manages a good home, a lovely wife with 2 kids. However he knows that behind this ‘meticulous’ management, are some very regular trade offs he makes. ‘Informed decisions’ as he believes – wherein he tries to assess the ‘real worth’ of a product – be it a vacation, or his kid’s school bag, or a new shaving lotion or even a hair care product – and makes sure that he doesn’t pay more than its perceived worth. At the same time, he is not your typical coupon collector or one who jumps on discounts or sale promotions in order to shop. He doesn’t compromise on quality while he provides for his family. He believes that money well equals commensurate value realised. So now with this image in mind, let’s say he goes shopping for him and his family (with a grocery list from his wife and a mental list that he has made for himself and for family). May be.. yes? Now just assume that it was you at this position at this point in time. Just think that you are shopping for a toilet soap. Would you want something that just cleanses? If so, you are better off with a cheap detergent soap..right? So wouldn’t you seek out for ‘an additional feature(s)’ from your soap? Be it a brand story that it is so good for your skin, or an natural ingredient story, or may be some imagery of how awesomely fresh it makes you feel,.. you get the drift right? Would you buy it? In fact would you even stop for a moment and consider it? Would John consider it? Would he spend his money on something that is say a dollar cheaper than the other soap, yet says it is “JUST A SOAP and nothing else”? Congratulations to the team behind Ivory for successfully commoditising a 140+ old history, a rich story of heritage, a brand associated with apocryphal urban legends in just one shot! 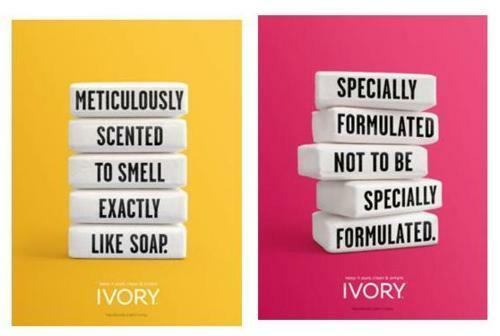 Congratulations for redesigning its brand elements like typeface, positioning, colors etc and thereby spending good amounts of money to do just one thing – stripping the brand off all its wonderful associations and painstakingly reminding the consumer that what they have known of Ivory as a brand of soap is in reality after all JUST A SOAP. Nothing else. Wow!! From the company that came some truly smart campaigns, I am surprised, shocked and in fact concerned to see a live case study of how a brand of nearly 150 years history can be shot in the head – point blank! I’m still curious – would YOU buy it? Or is it just me? PS: The views provided here are solely mine in my personal capacity and not related to any other person dead or alive, or any company big or small for which I might have or haven’t worked for! This entry was posted in Uncategorized and tagged Beauty, Brand, Commodity, Logo, Redesign, Repositioning, Soap. Bookmark the permalink.